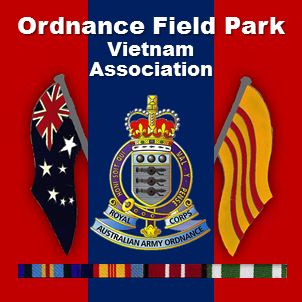 2004 – Cowra NSW – Ordnance Field Park Vietnam Assn. CAN WE KEEP UP THE STANDARD? YOU BET WE CAN!!! When we first chose Cowra NSW for our 2004 Reunion, most people’s reaction was “Why Cowra, what’s out there?”, but everyone who attended the reunion agreed what a great little town it is, we all had a wonderful Anzac Weekend. Our numbers were really pleasing, with 51 Vets attending, including waves/partners etc. our numbers were 102 in all. The Reunion commenced on Thursday 22nd April and concluded on the evening of Sunday 25th April 2004. Our main accommodation and function centre was the Town House Hotel, Cowra. Thursday 22nd saw a steady stream of arrivals with a meet and greet filling up the Town House Hotel bar area by late afternoon. Friday 23rd was the first official day of our reunion and everyone gathered outside the Town House a 0915hrs to board our coaches for a tour to The Dish at Parkes. The whole facility was very interesting and we enjoyed watching The Dish on the move while we had lunch at The Dish Café. We arrived back in Cowra at 1530hrs with enough time to get ready for the main event – the dinner dance- while some of the guys went to the RSL to meet the local committee and help fill their coffers. The reunion dinner was held upstairs at the Town House in their function room. The staff did a wonderful job of decorating the room for us. We all settled in to enjoy a delicious three course dinner with plenty of beer and wine. Our DJ, Laurie, then fired up and everyone enjoyed an evening of dancing and singing. A great night was had by all. Saturday 24th saw everyone up, bright eyed and bushy tailed, outside the Town House at 0915hrs, to board the coaches for our tour of Cowra. We started with a lovely morning tea at the Cowra Visitors Centre and Rose Garden before heading off to the Australian Japanese War Cemeteries and the POW Campsite. We enjoyed a picnic lunch in the Japanese Gardens and Cultural Centre – absolutely beautiful place. Following this we visited Australia’s World Peace Bell and the Cowra/Italy Friendship Monument. To round off the day we spent a fantastic hour and a half at the Cowra Fun Museum. We arrived back at the Town House around 1530hrs for a quick rest up before re-grouping at 1800hrs for a BBQ. Sunday 25th – Anzac Day – and around 50 of us rose to attend the Dawn Service at the Cenotaph outside the RSL. At 1000hrs we gathered all our troops and made our way up to the RSL for the Wreath Laying Ceremony prior to the Anzac Day March. This year our wreath was laid by Ken Hussell (OC Det 6 OFP and a local resident) assisted by his son Ben and daughter Rachel. The Anzac Day March was a little different this year in that all the banners were carried by cadets at the front of the parade, and not in front of each group. Our banner was still the biggest and the best and our guys still marched with great pride. Following the service at River Park, we all returned to the Services Club for a lovely roast lunch put on by the Ladies Auxiliary. The rest of the afternoon was spent at the Services Club and downstairs at the RSL Club room. By around 1800hrs we had all returned to the Town House and sat down for our final evening together as a group. A presentation of an engraved bottle of port was made to the Manager of the Town House, and his hard working staff, for all their assistance over the weekend. The laughter and good times continued. A fitting end to a super weekend.